Hungarian police on Monday struggled to control refugees entering by the thousands at Hungary’s border with Serbia. Police kept a large group of exhausted and anxious refugees in a holding area, a few meters from a gap in the border fence where a rail line linking Serbia and Hungary passes, and where most refugees have been entering on foot. When buses arrived to begin loading the refugees to take them to a registration center, hundreds of them stampeded. Some tried to board the buses, while others set out on foot on the highway to Budapest, where many hope to catch trains to the Austrian border and on to Germany. “Every day, thousands of people come across. Only today, it’s more than 2,000 people who have crossed this border line, which means they have entered the European Union,” said Kristof Gancs, a spokesman for Hungarian Interchurch Aid, a relief organization. Gancs and other relief workers gave directions to the migrants arriving on foot along the railroad tracks, some pushing strollers with babies and elderly people in wheelchairs. Migrants discuss with a policeman as they wait for trains at Keleti railway station in Budapest, Hungary, Sept. 8, 2015. Refugees interviewed all told similar stories of fleeing war in their homelands. “I really want to go to a place where I could be alive, to be alive,” said a refugee from Afghanistan as he approached the police holding area from the border fence. Relief workers also tried to calm the nerves of some migrants who feared Hungary would send them back. In a policy shift, Hungary is now granting passage to the Austrian border for those who state they are refugees and not economic migrants. In the process, Hungarian officials are taking their fingerprints and holding them at registration centers while their status is determined and decisions are made whether to send the migrants on to the Austrian border or return them to Serbia. At a gap in the border fence, on the Serbian side, a group relaxed and roasted corn on a campfire. Refugees rest on the side of the road in northern Serbia. The path along the railroad tracks was littered with torn migration documents from Greece. Many of the migrants tried to destroy any evidence of their prior presence in the European Union, in the belief that it might somehow be cause for Hungary to deport them. Most want to go to Germany via Austria. There is only so much relief workers can say to reassure the migrants as EU governments decide how to deal with the influx. On Monday, both France and Britain agreed to accept thousands of people from the war-torn Mideast. But the numbers they have agreed to take in – France said it would take 24,000 over the next two years; Britain, 20,000 over the next five – are dwarfed by the sheer masses of migrants streaming in. Germany has said it is willing to accept 800,000 migrants, many of whom already have relatives in the country and are being urged to join their families there. Europe's wealthiest country, Germany also said Monday it is making an additional $6.6 billion in public funds available next year to absorb the refugees into German society. 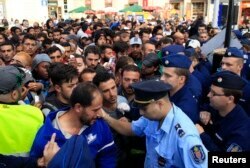 Europe has struggled to cope with the continent's biggest migrant crisis since World War Two, with Hungary at the forefront of trying to block their passage to much wealthier Germany and Scandinavian countries. Meanwhile, Hungarian Prime Minister Viktor Orban denigrated the EU's call to distribute migrants through a quota system. Orban described his country as a "black sheep'' representing a voice of reason in the 28-nation EU. The flood of refugees is unrelenting, with 15,000 to 18,000 stranded on the Greek island of Lesbos in what migration minister Giannis Mouzalas described as "miserable" conditions. He said two-thirds of them would be transported to the Greek mainland in the next five days. One Lesbos resident, Efi Latsoudi, deplored the Greek effort to cope with the influx of refugees. ''The situation is the result of our political unwillingness, or incapacity, or don't know what it is, to help these people," Latsoudi said. "We never created reception conditions, we never created a place that these people have some support, have some information in the system." Hungary is fortifying its border with Serbia with razor wire. Despite Hungary's opposition to the mass refugee migration, passage through the country is much smoother than it was last week when the central European nation seemed ready to do whatever it could to prevent the migrants from entering the wealthier western European nations. Hungarians are now posting Austrian train schedules for the refugees at Budapest's Keleti station. Last week, police tear-gassed the migrants at Keleti who wanted to go to Austria. The train ride from Budapest to Vienna is not exactly comfortable as refugees have to wait in long lines, but at least the journey is possible, which it was not last week. Austria has, however, said it plans to lift the emergency measure that has made that route relatively easy. 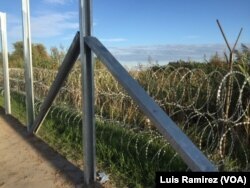 Other information in the pipeline that could change soon includes a number of holes and gaps in the razor fence at the Hungary-Serbian border. Hungary says it intends to patch the holes, but for now, refugees are streaming through.